Link to the old elcano challenge! 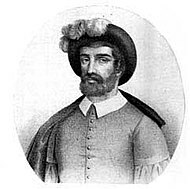 Juan Sebastián Elcano (1476 – 4 August 1526) was a Spanish explorer of Basque origin who completed the first circumnavigation of the Earth. After Magellan's death in the Philippines, Elcano took command of the nau Victoria from the Moluccas to Sanlúcar de Barrameda in Spain. This challenge is simple. So simple, it's easy. Well...it sounds easy. Those of us who have completed it would probably disagree. The challenge to you is to become the next Elcano. To do what no one, or very few, have done. A challenge to circumnavigate an orbital body, be it moon or planet, solely by ground and/or water. Plant a flag at your beginning spot and return to that flag... the long way around. Any combination of launching, refueling, or docking is permitted. The vehicle must be Kerballed during the circumnavigation. 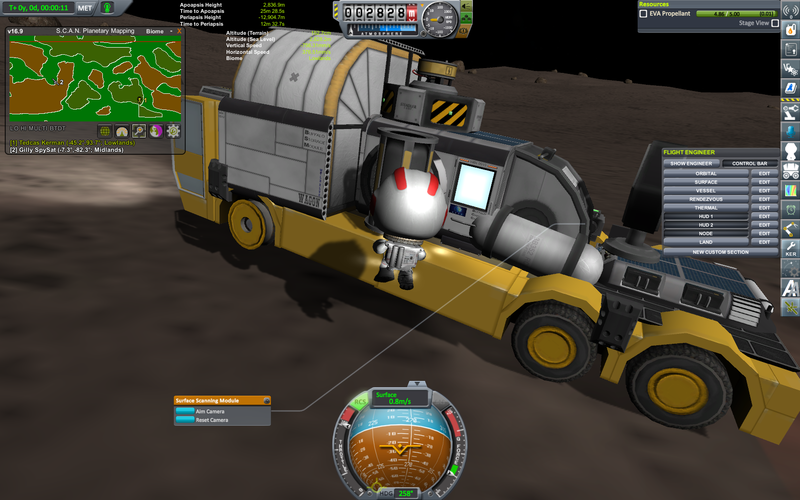 The ship does not have to be launched or delivered in one massive mission, but there needs to be at least one kerbal onboard the rover/boat during the circumnavigation (capsule, cockpit, seat, or loose). The same vehicle that crosses the land must also cross water. No ferrying your vehicle on a boat. You may send replacement vehicles. If you read Fengists' circumnavigation of Eve, you'll see why. Game mechanics are not kind to ground vehicles. Your crew must be transferred to any replacement vehicle and it must be very similar to the original. I understand this is a learning process...and will allow some design changes. You may use aerial and orbital recon vehicles. You may refuel if needed. Use of ISRU (or similar mods) is permitted. Saving and reloading (F5/F9) is permitted. Exception: Circumnavigations on RSS Earth are allowed, given the origin of this challenge. Any rule I haven't thought of that breaks the spirit of this challenge. The point of the challenge is to build a rover/boat, deliver the vehicle, and circumnavigate the body. Proof: Document your journey via images, or as those of us who have manage to complete this feat, by words and pictures. Stock Craft - The craft and all support craft are made from all stock parts with their stock configuration. 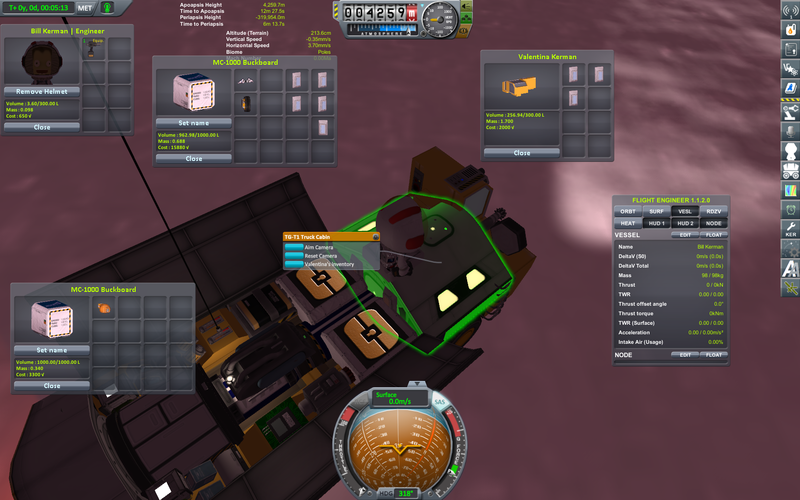 Installed mods may not modify physics or add/modify parts in use by the craft. Mods that add PartModules to stock parts, but do not alter the stock parameters, are also permitted. Examples of permitted mods are information displays (such as KER), transfer window planners, and visual enhancements (such as EVE). “Stock Craft” means the .craft or save file can be used on a stock install and it looks/works exactly the same way (your mission would remain effectively unchanged without the mods). This challenge is not for the feint of heart. It will take persistence and a great deal of patience. If you're the competitive type and think of this challenge as a race, it will get boring really quick. If you look at it as I, Fengist, and Wooks did (as an adventure) you'll find plenty to keep you entertained. Since this is challenge is more about the journey than reaching the destination, feel free to create a thread in Mission Reports so that everyone can share in it. It doesn't matter whether it fails or not, everyone there loves to read the stories, even the sad ones. Be cautious when quicksaving. Some vessels in particular (especially with robotics and/or movable parts) are prone to errors with alignment after repeated quicksaves/quickloads. Gravitational and motion stresses on ground-based vehicles are a LOT more than spacecraft. If you quicksave while a part is misaligned due to these stresses and then reload, you just doomed your vessel to a corrupt save. This theory was originally posted by Fengist in his Elcano thread, and seems to strike some vehicles harder than others. Claw - Stock - Completed all circumnavigations! Those who have circumnavigated both Kerbin & Laythe via ocean. @Magzimum Post is here! First elkano in 1.2, Stock craft, but did use KER. smart use of kerbnet system to keep track of his rute. Shush! Did you hear something? I have 2 questions from the original post that weren't answered due to claw going away . 1. Can I use kis/kas instead of sending replacement craft all the time? I will bring a limited amount of repair parts, so if they run out I still will have to send a resupply ship, but I have severe issues, a.k.a. rapid unplanned disassembly, when it comes to bringing craft via airplane places. 2. Given my issues with bringing cargo in planes, can I start and end from the runway instead of flying it somewhere else? thanks for bringing this back to life!! Umm. I posted this in the old thread, but did not receive a response from Claw yet. I guess I will re-post it here then? Friday, I read about the crazy adventures of Claw (seriously, Jool-5 and Elcano in one mission! Congrats!). 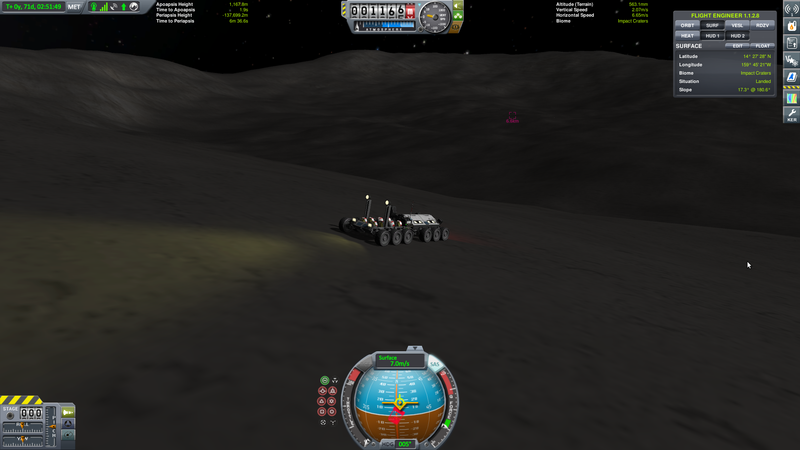 As I was playing around with rovers yesterday, I thought that I should do a circumnavigation of a moon or planet too. To my novice eye, Minmus appears the easiest: due to its size (small) and location (near Kerbin). I decided to give it a go. The whole adventure is logged in this Imgur album. The rover is a pretty simple one. It has just the basic stuff you'd expect. Hidden from the picture below are the two reaction wheels on the bottom, to keep the rover straight during the many jumps on Minmus. There are 4 RCS thrusters that face upwards, but that make the rover crash when used. There is about 3000 units of electric charge, so the rover can keep going at night. 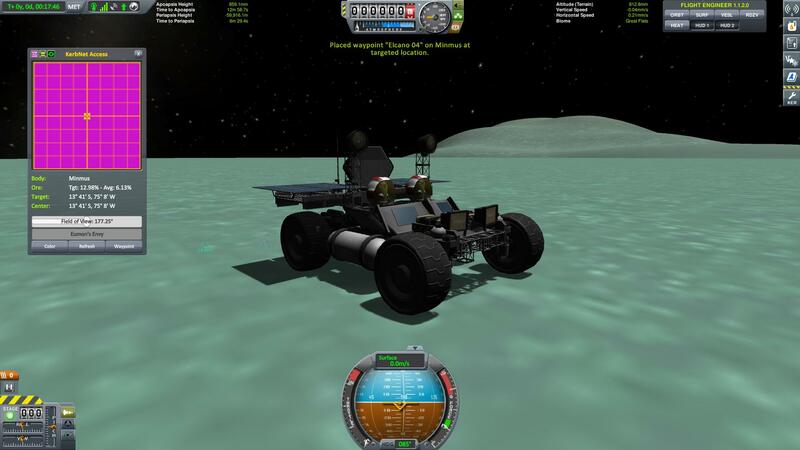 The rover is quite heavy: 5.1 tons, Kerbals excluded. 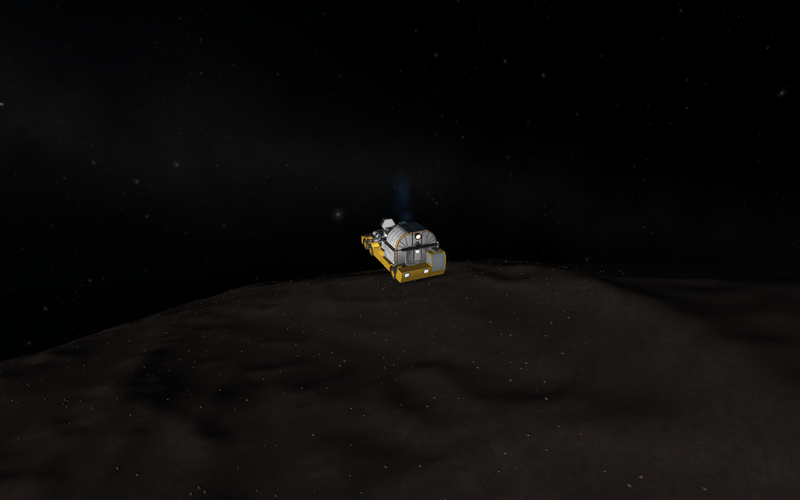 This is done on purpose, to give it a little traction on Minmus. So, there are quite a few beams used, some for structure and some just for the looks. The two monoprop tanks are there mostly for their mass, as I almost never used the RCS (did I mention it makes the rover crash? Yeah...). The rover comes with illuminators, which make it a little easier at night, but which mostly just look cool. And it has redundancy in solar panels and antennas since those stick out and may break. Nothing sticks out from the wheels on the front, and it has enough ground clearance to be able to make some big jumps. 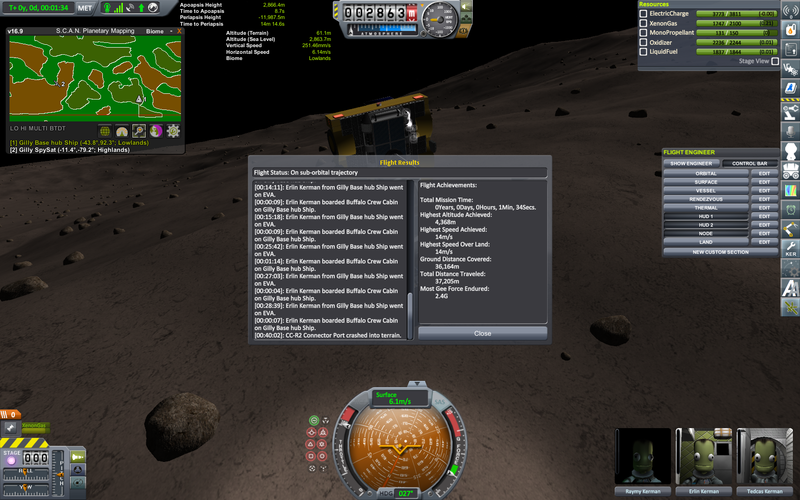 The rover is connected to Kerbnet, so I can place waypoints, which makes it easy to trace where I have been. Compared to placing flags, it is much easier: you can do it on the move. 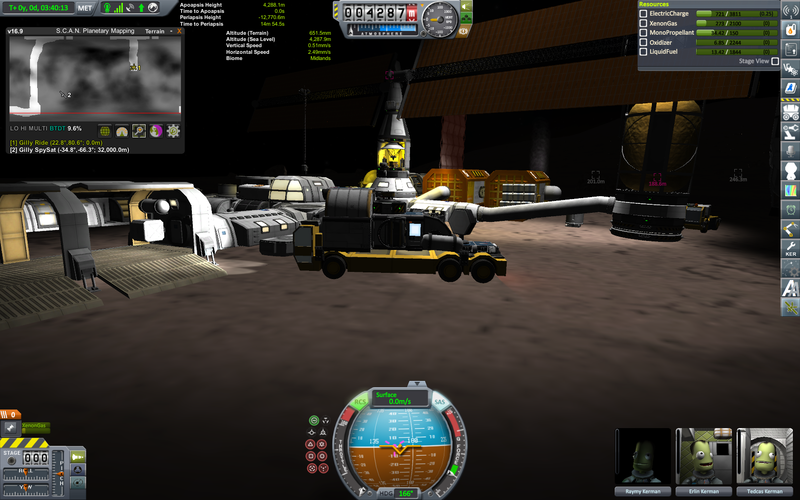 All parts (launcher and rover) are stock, but I did use KER, so I guess I compete in the "Stock Craft" category. 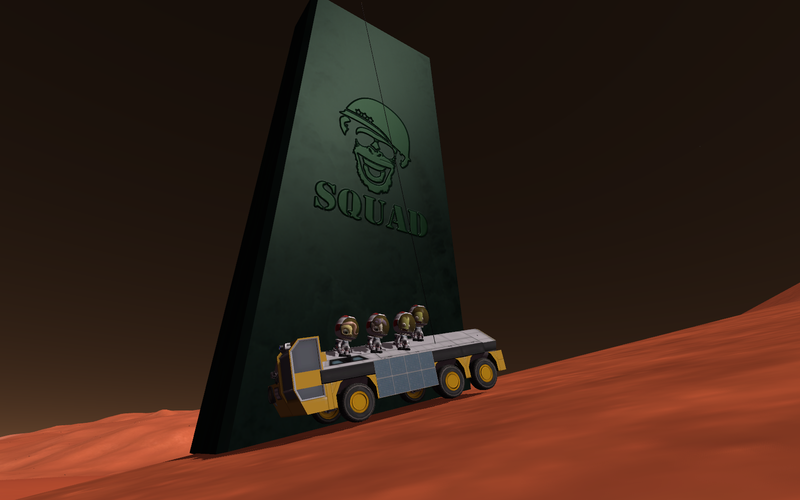 Above: A good close up of the rover on Minmus. 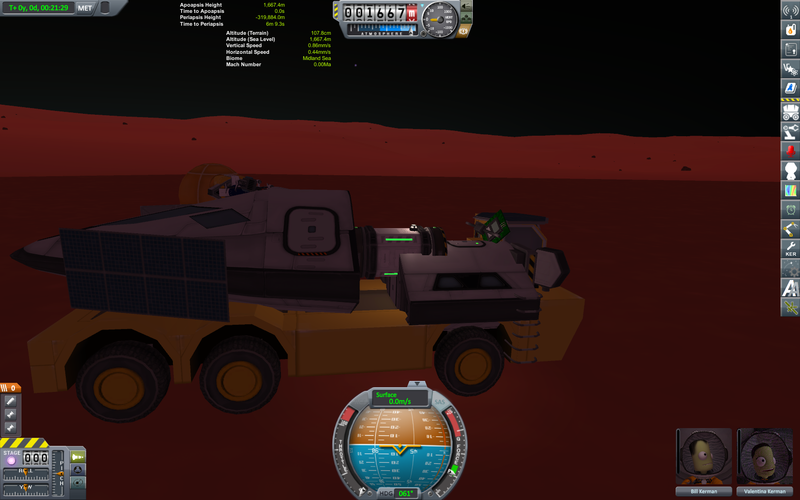 Jeb & Bill are the pilot and engineer (Bill had an easy time, as nothing broke that needed fixing). 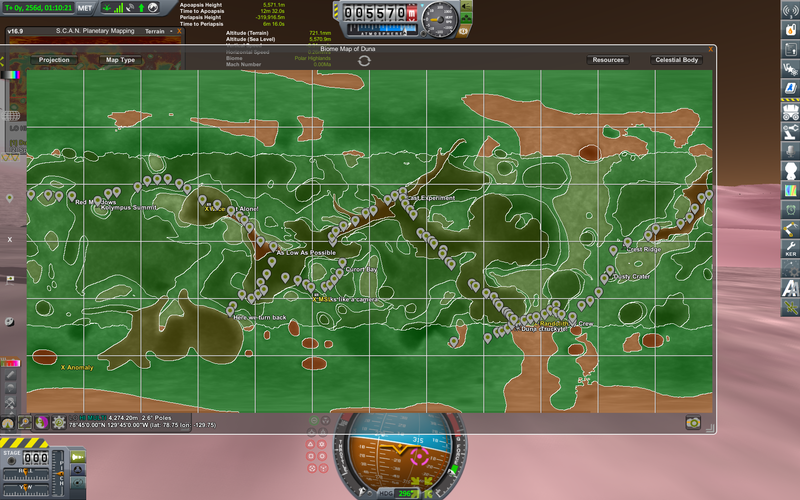 And here a picture showing all the waypoints. 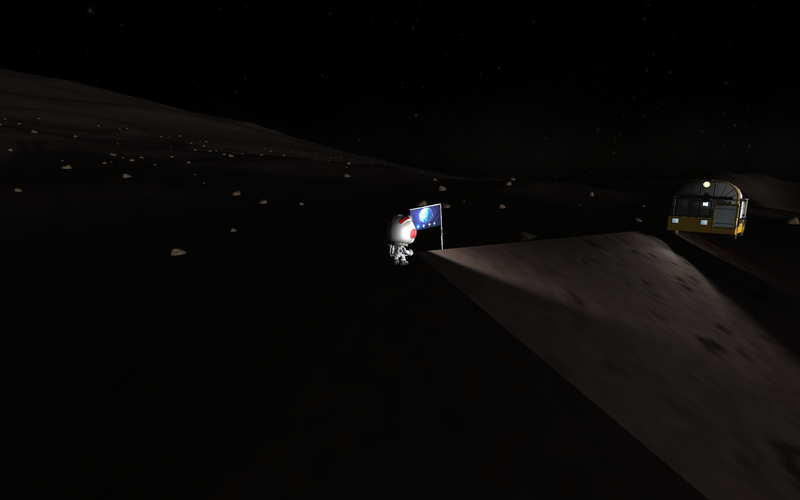 The trip was completed in 3 Minmus-days, and in about 6 hours of game-play, including some reloads and touristic detours. It actually went according to plan: everything worked as expected, the average speed was probably around 30 m/s if you exclude the touristic stops. 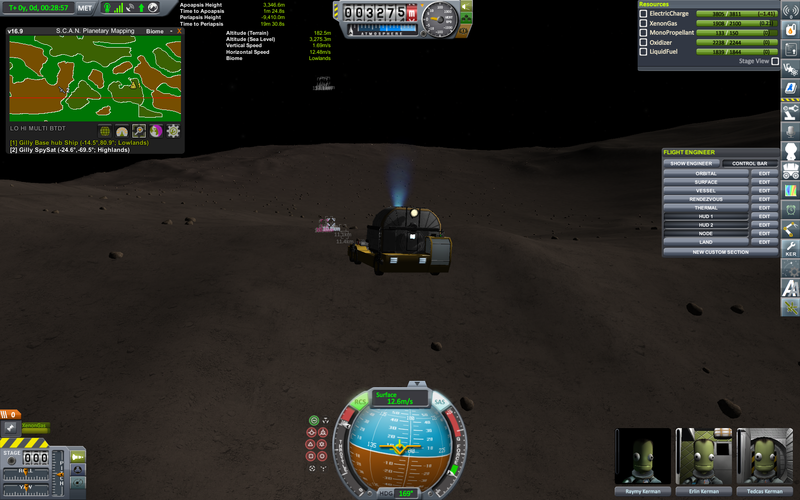 And the rover did not break (one monoprop tank went missing, but that did not stop the mission). Next I am gonna build a mining colony on Minmus so the rover(s) will be put to good use for that. The Imgur album contains 66 pictures, with description... I did not link all pictures here, since that would make the thread too long. Thanks for giving me the idea to do a circumnavigation. I got the idea that I have seen a LOT more of Minmus in just these few hours than in months of gameplay before. quoted my own post, so it hopefully links to the original location. 1) Why on earth wouldn't you be able to (in a modded attempt)? I brought KIS/KAS spares every time. 2) This question makes no sense to me. @Magzimum it's fine to post your old atempt here as long as it was completed in 1.2. I have added you to the learderboard oh and remember to take your badge! Would my entry be valid if I started the Elcano Challenge in 1.1, and am planning on finishing it in 1.2? I don't use mods. Does my entry for Duna qualify? I'll understand if it's rejected for not following the equator but instead trying to get to every biome there is. 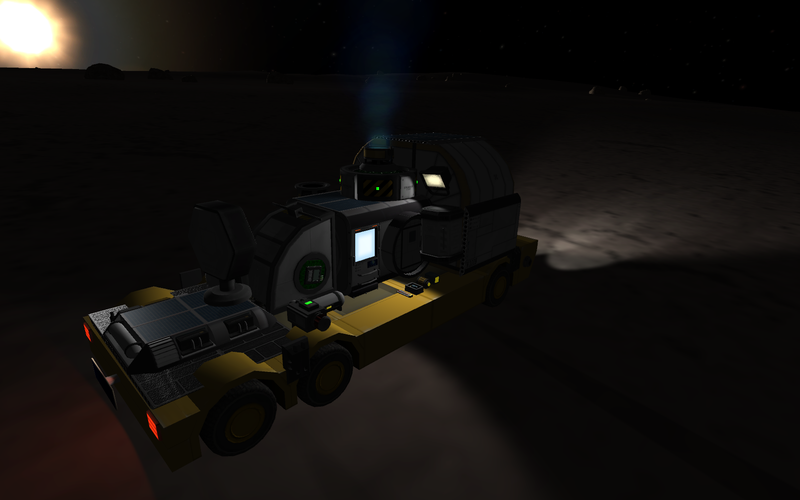 The rover was a Yellow Trucky from VAB/SPH (provided by the SXT mod). Crew of four; two pilots, scientist and engineer. Two kerbals, two ponies. MK2 bays tweakscaled down to 1m to fit width of trucky precisely (this reduced capacity of the MK2 crew cabin to 3). Assorted minor parts from various mods - a very crappy antenna that was later replaced for the radial Commutron 16 stripped from an earlier lander, a Solid Electric SRB which I had hauled all around Duna to provide me with boost at steepest slopes, and which I used maybe for 3 seconds one single time, depleting maybe 3% of the propellant, KAS boxes, rescue shelter, Klaw-like arm, most of that not needed really. Even a spare wheel in one of the boxes KIS screwdriver was in use from time to time. 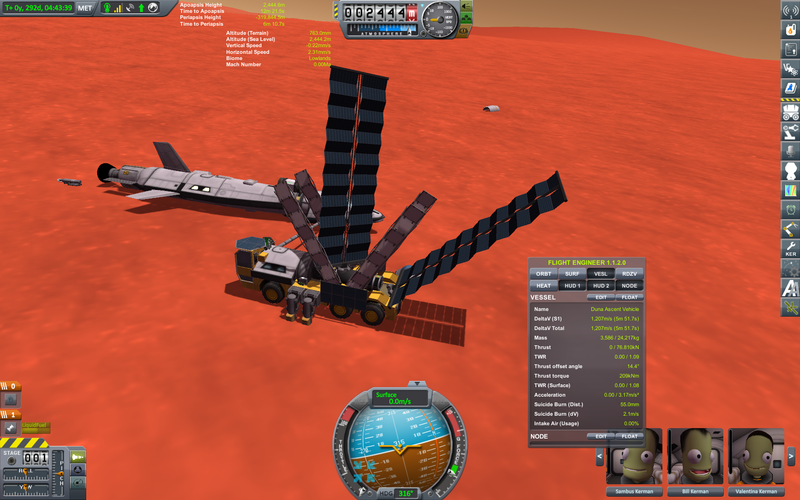 The delivery to Duna was very generic - Twin Boar + 2 orange tanks to orbit, Poodle plus medium Rockomax tank to Duna, and entering suborbital trajectory, Trucky covered in parachutes from all sides entering near southern pole. Bill's first task was to strip all these parachutes Some 15m/s impact was nothing to Trucky's sturdy wheels. 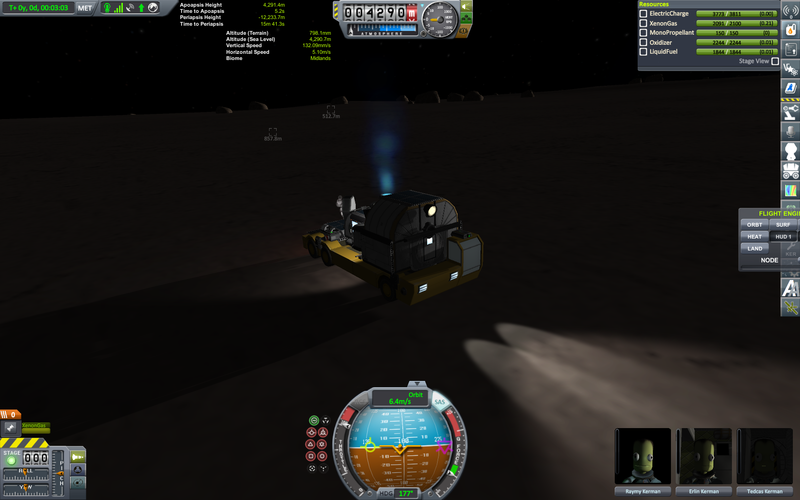 Upon finishing the circumnavigation, Trucky took up a secondary work - rescuing a stranded kerbal and his craft, delivering to Duna Ascent Vehicle. Currently, it took up a third role, a resident mobile ISRU platform, to provide fuel to any stranded craft. No crew, but the probe core is capable of navigating Duna. @Sharpy it does qualify, i should change the rules the challenge. it is about the journey. whatever i will add you to the learderboard Congratulations! The vehicle was 90% manufactured and entirely assembled on site. 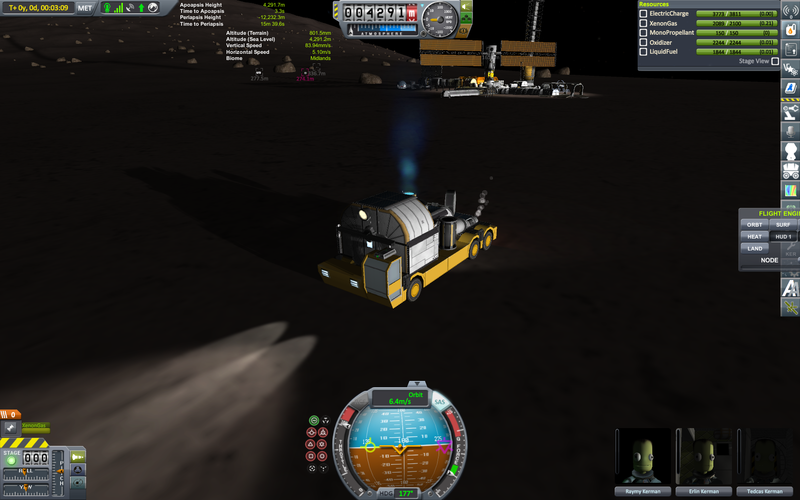 I think only two wheels, the monopropellant tank and the KAS refueling port arrived from Kerbin. Also, only that monoprop tank, science items and an antenna were stock. I had serious problems finding any stock parts to activate autostrut. It's based upon the larger SXT truck, with Buffalo rover parts for crew and (unneeded) fuel tank. Entering the first Lowlands was... dangerous. I lost the KAS port, and had to repair a wheel after fall from good 1000m. Luckily no other casualties. Surveys were conducted, and I moved to the nearby anomaly. Unfortunately, the return would be over the night side. Noticing I hardly used any fuel, and the jumps are burdensome, and the ion engine really struggles to keep me down, and I'm running low on xenon, I dumped most of the fuel. I reached the north pole, then progressed back to base. Pretty cool to see the top of the tower sticking from behind the planetoid's curvature! And at last I finished the circumnavigation. 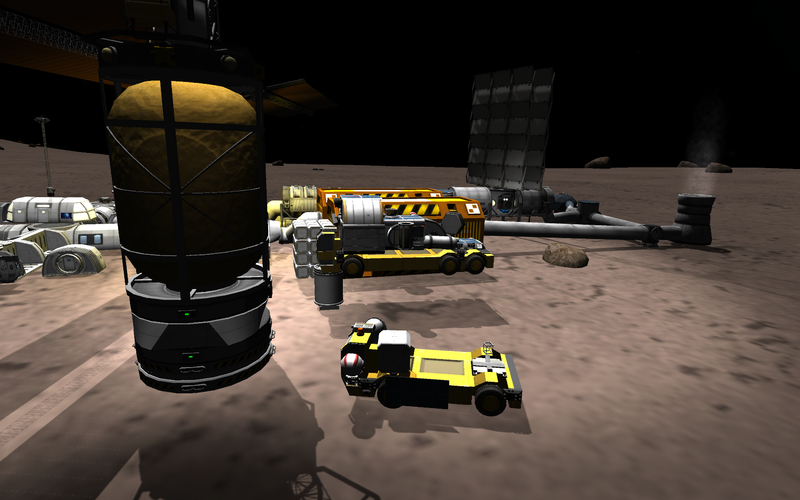 One evening constructing the rover, two more to circumnavigate Gilly. 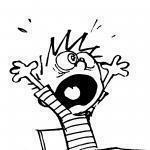 Sorry for my late answer (got dammit school always gets in the way). I don't know if your entry does qualify scince you build the rover there. So it breakes rule one. Other than that it is a ligid entry good job . We went to Dres. We chose to go to Dres. Not because it is hard. But because Dres needs love. 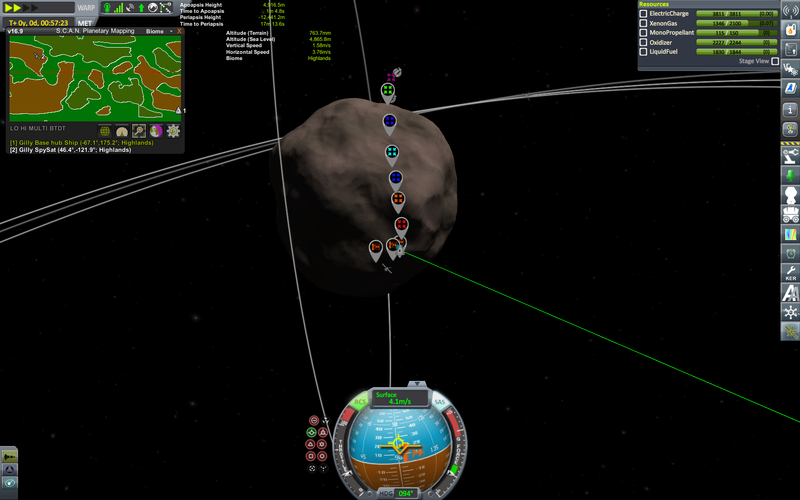 And we chose to drive around her and do the other things... not because it is hard, but because Dres is round. 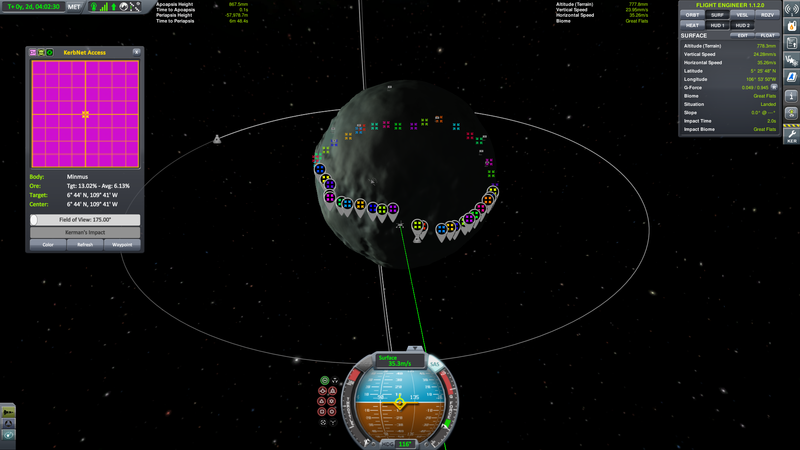 Eight Kerbals. Twelve wheels. One Planet. The Circumnavigation was on. It is part of a much larger mission to give Dres the attention she deserves. (The other Dres mission posts are in that same thread, the link here should lead to the Elcano challenge post, which is the 3rd post in that thread). It is all stock. I believe that's relevant to some people. Ok, when new Kerbin-Eve window opens I'll send another and repeat. It's really easy once you know just *what* needs to be done (finding that out is the hard part!) and so having the hard part behind me I can 'fix the deficiency' rather easily. And I'll make the rover way lighter, resulting in better TWR of the push-down engine and as result dealing with the multi-kilometer jumps. It took me 14 days to travel (mostly) by sea. I started out planing to stay on the equator for the entire trip, but then I realized how much attention land travel requires. So, I switched to a (mostly) sea voyage. 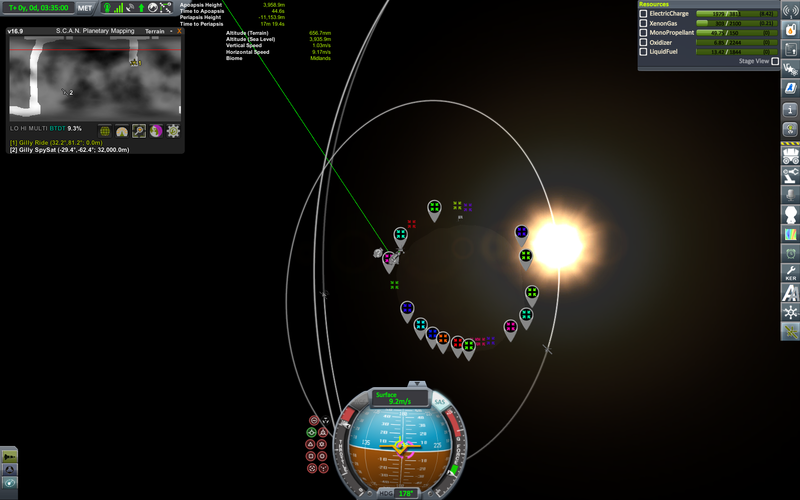 Then I discovered how tedious endless cruising and refueling is. I figured 30m/s gave me the best combination of speed and efficiency. It took me 14 days to travel (mostly) by sea. I started out planing to stay on the equator for the entire trip, but then I realized how much attention land travel requires. So, I switched to a sea voyage. Then I discovered how tedious endless cruising and refueling is. I figured 30m/s gave me the best combination of speed and efficiency. The sea path around Kerbin is pretty clear. Any tips for a path around Eve? Just follow the coast? The last stretch was a crossing of the ocean that covers nearly half of the surface. 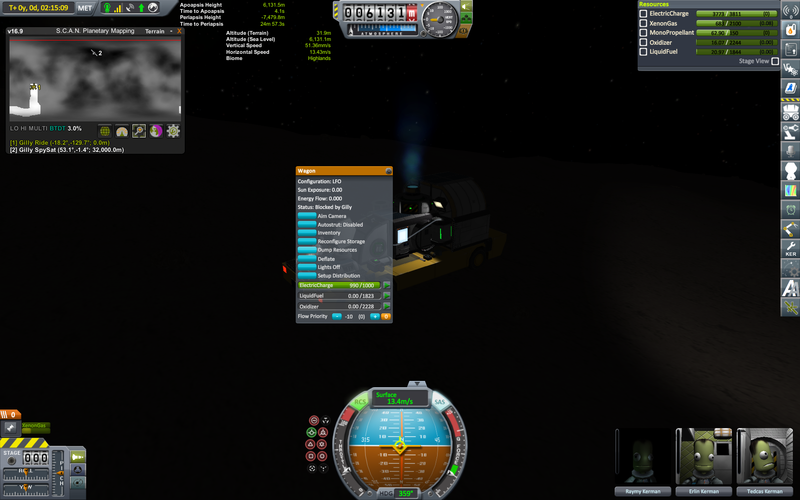 To maximize fuel efficiency, I had to do most of it at 7.5m/s. Even with 4x physics warp, it literally took 8.5 human hours. Next trip: Mun & Minmus. I am looking forward to a land voyage where I don't have to worry about fuel. 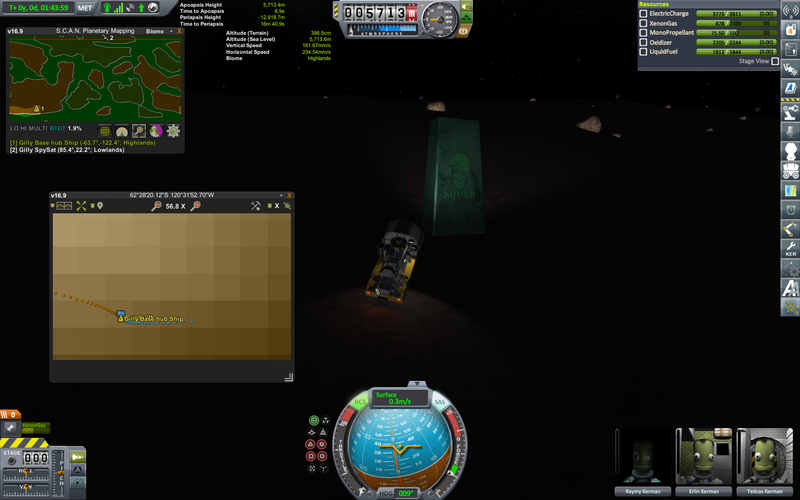 Yeah...so...driving on Minmus is friggin' hard. Wow. Good luck. These missions have really given me an appreciation for how large these bodies are. Are you doing some sort solar powered system? Paddle wheel? Don't try to drive. Embrace that low gravity and realize that you will spend more time above the surface than on it. Install enough reaction wheels. You will spend more time flying than driving, so you make sure that the nose is pointed in the right way with reaction wheels, not with the (front) wheels. I managed to get around Minmus at roughly 30 m/s on average (post is near the top of this thread). 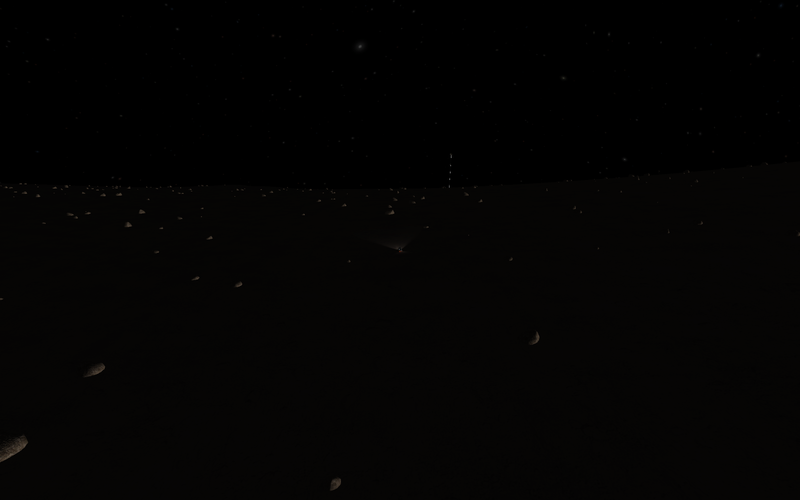 Dres was way harder, because of the rough terrain.